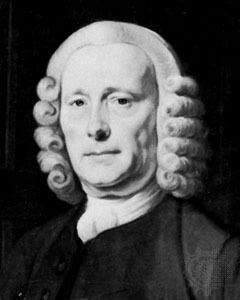 John Harrison was born on March 24, 1693, the first of five children of an English carpenter. When he was six years old, Harrison contracted smallpox and was given a watch to amuse himself. This watch would help to form Harrison's later career as a clock maker. In 1713, Harrison made his first longcase clock. He built almost all of his early clocks entirely out of wood, and from 1713 to 1728, John and one of his brothers built several precision pendulum clocks. Harrison is responsible for many innovations that have been used in clocks throughout the ages. Harrison invented the gridiron pendulum, which was made of alternating brass and iron rods. In different weather conditions, one of the metals would contract while the other expanded, canceling each other out and allowing the pendulum to swing at the same pace. Harrison also invented the grasshopper escapement, which allowed the driving power of the clock to be released in small increments. The grasshopper escapement allowed clocks to function without requiring lubrication. As people began to travel over the ocean much more frequently, a need for an accurate time keeping method was needed aboard ships. The Board of Longitude in London offered a £20,000 pound prize to anyone who could come up with an accurate way to tell time aboard a ship. Most proposed ways to calculate the time on a ship revolved around astronomical observations and the current position of the ship. Ships would use their distance from London, along with observations stars and planets, to calculate an estimate of the time in England. Unfortunately, these calculations took quite a bit of time to calculate and even longer to invent. Harrison, instead of creating calculations, decided to actually make a clock that was accurate on board a ship. Most clocks at the time were not reliable at sea because of changes in pressure, temperature, and humidity, and pendulums do not work well when rocking violently at sea. By 1730, Harrison had created a description and drawings for a marine clock that got around these obstacles. The first model, Harrison Number One, or H1, was finished in five years. Harrison's design was tested by the Board of Longitude in 1736, when it sailed to Portugal. The clock performed well, but the Board wanted a transatlantic sea trial. Because Harrison's proposal was the first proposal worthy of a sea trial, the Board gave Harrison £500 to continue his work. By 1741, H2 was finished, but at this time, the British were fighting the Spanish in the War of Austrian Succession. H2 was deemed too important to risk being taken by the Spanish, so the sea trial was canceled. Harrison gave up on H2 when he discovered a major flaw in it, so he began working on H3 while he waited for the war to end. After seventeen years of working on it, H3 did not perform as he had hoped it to, so in 1758, Harrison moved to London to find new ideas. It was in London that he realized that he could turn his marine clock into something as small as a watch. In six years, Harrison had finished H4, which was the first marine watch. Since he was 68 years old at the time, Harrison sent H4 with his son, William, on the sea trial in 1761. When H4 reached Jamaica, it was off by only 5 seconds, corresponding to an error of only 1.25 minutes of longitude. When H4 returned, the Board of Longitude claimed that the accurate reading was due to luck and demanded another trial. When Harrison demanded the prize, the Board offered only £5000 for the design. Harrison refused, but sent H4 on another trial. On the same voyage, Reverend Nevil Maskelyne tested his Lunar Distances Method of time as well, which used the angle between the sun and the moon to calculate the time. When the Americas were reached, H4 was, in longitude, 10 miles off, while the Lunar Distance Method was 30 miles off. Though H4 had succeeded, Nevil Maskelyne had secured a position on the Board of Longitude, where he gave a negative review of H4. The Board kept H4 indefinitely for 'testing', giving Harrison only £10,000 for his work, so Harrison began to work on H5, finishing three years later. To try to get the prize money from the Board, Harrison obtained a petition with King George III. King George, who was already annoyed with the board, force the Board to test H5, and in 1772, the clock was found accurate within a third of a second per day on a land-based test. In 1773, when Harrison was 80, he received £8,750 from the Board. If the grants and the £10,000 payment are included in the prize money, Harrison received a total of £23,065 for his work, which, adjusting for inflation, would have made him a multimillionaire in today's world. He died three years after he received his prize money. John Harrison is on our list because he was not only the best at what he did. He also dedicated his life to his work and created an accomplishment that has helped sailors around the world know when to eat lunch.